You are a prisoner, doing forced labor for the “Argon Company”. What it is that you do, you will never get to see. The Argon Company is described as a mining facility but we don’t get to see anything hinting at that. But one night something went wrong and you get a chance to escape from your cell. However, something in the complex has escape with you and it is out for blood. Case#9 is a first person puzzle game with puzzle elements. In genre fashion you will have to solve a series of puzzles, mostly involving unlocking doors in some way while occasionally something spooky happens. The game is fairly competent at this even if it felt to me like a lot of puzzles did not necessarily make sense. For example: at one point I progressed a level because I activated a laser. Now, the laser effect was well done, the production value of the game is pretty good in general, but there was no real reason what that laser did and why I was able to proceed because I activated it. Escaping a prison cell is always a tough puzzle to make believable. I have struggled designing that type of puzzle before and find that the author has done a pretty good job with how its handled. This puzzle stood out to me as pretty decent. It is slightly frustrating that the characters motion speed is reduced. I feel like I’d have enjoyed the game a lot more if I was able to move a little bit faster. With any kind of combat removed, the creature that is stalking you not posing a real threat, the gameplay really just consists on walking around, reading info dumps and using the right objects until you can unlock the next door. All in all, the game felt more like a beta version of something with gameplay elements missing rather than a fully fledged game. I’m a sucker for subdued horror that creeps up on you, but this games horror elements are so subdued and inconsequential that you get pretty much right away that all they are are scripted tiny sequences. The creature you get to see in the end is kind of a let down as well. There is no way around this but this game is blue. 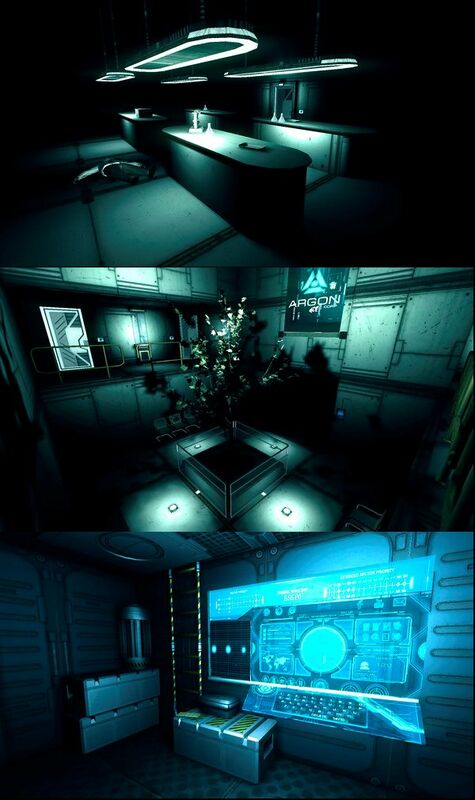 With the exception of some red and yellow highlights you will spend the entire time playing in blue-ish corridors and areas reminiscent of the french scifi flick “eden log”. The production quality is very high for this type of game. Levels have a certain level of visual polish. There are no objects that are stuck out of place as in many FPSC games due to a wrong shader being used and the HUD elements are well crafted. PDA and in-game interfaces are particularly well made. The game tells you that the Argan Company is a mining facility…but we never get to see any hint or trace that this is the case. In fact, most areas we walk through are more akin to laboratories. It is supposed to be a prison, but apart from the cells in the starting area, there is never much of a feel that prisoners are handled in these spaces. No visual security installments and nothing that would even hint at a correctional facility. There are three types of areas we get to see: Maintenance areas, labs and office facilities. It feels like the surroundings have been lovingly crafted to fit one setting but the story ultimately went with another one. Apart from a few corpses here and there, the whole area is also extremely clean. There is no realy hint of a monster being around or any kind of struggle/evacuation having happened. If this has been done deliberately to make the surroundings have an eeriee ghostly atmosphere, it all feels more empty. I might have criticised the game a lot but I still feel that a lot of work and effort went into this game and some really neat attention to detail. A lot has been done with FPSC’s capabilities and the game ran quite well for me. I will certainly keep an eye on the developer and recommend this game to all other FPSC users or people who have used it in the past. I can not recommend this to a more general audience as the 30 minutes of rather dull gameplay to not warrant a price of 2,99 €. Have the levels be coherent with the plot. If its a mining facility, let us see traces of this. If there is a monster running amok, let us see some tables that have been flipped over and hints of this. If you are not a native english speaker (like me) have someone who is read over the texts of your game. If you remove combat you will make up for the lack of one game mechanic with another. More engaging puzzles and especially an interesting plot line help a lot. If the concept of a monster stalking around the same facility as the defenseless player, that monster needs to pose some kind of threat or at least provide the illusion of a threat. This entry was posted in Reviews, Spotlight and tagged 2017, Case 9, Case9, dream, first person horror, fpscreator, indie, Peace, review, scifi, Spotlight, steam. Bookmark the permalink.